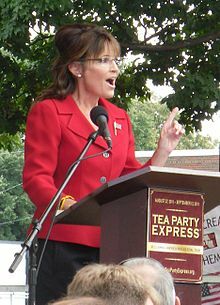 Sarah Louise Palin (/ˈpeɪlɪn/ ( listen); née Heath; born February 11, 1964) is an American politician, commentator, author, and reality television personality, who served as the ninth governor of Alaska from 2006 until her resignation in 2009. 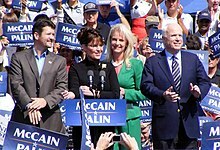 As the Republican Party nominee for Vice President of the United States in the 2008 election alongside presidential nominee, Arizona Senator John McCain, she was the first Alaskan on the national ticket of a major political party and the first Republican woman selected as a vice presidential candidate. Her book Going Rogue has sold more than two million copies. In the November election Palin was outspent but victorious, defeating former Democratic governor Tony Knowles by a margin of 48.3% to 41.0%. She became Alaska's first female governor and, at the age of 42, the youngest governor in Alaskan history, the state's first governor to have been born after Alaska achieved U.S. statehood, and the first not to be inaugurated in Juneau (she chose to have the ceremony held in Fairbanks instead). She took office on December 4, 2006, and for most of her term was very popular with Alaska voters. 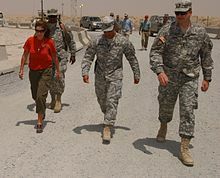 Polls taken in 2007 showed her with 93% and 89% popularity among all voters, which led some media outlets to call her "the most popular governor in America." 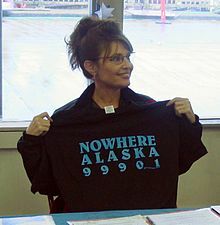 A poll taken in late September 2008 after Palin was named to the national Republican ticket showed her popularity in Alaska at 68%. 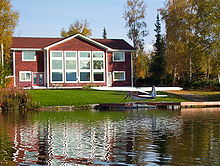 A poll taken in May 2009 showed Palin's popularity among Alaskans was at 54% positive and 41.6% negative. 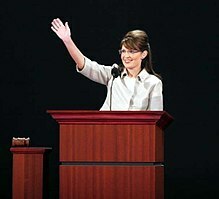 In the middle of 2010, Palin flagged the launch of a new "Pink Elephant Movement". [not in citation given] She set about endorsing a number of female GOP candidates. Her endorsement helped Georgia Gubernatorial candidate Karen Handel to take the lead in the campaign for the Republican nomination, although Handel lost the primary. 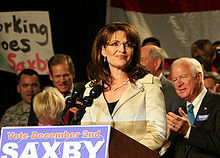 Palin endorsed several female candidates nationally. Ryan Rudominer, a spokesman for the House Democratic campaign operation called her involvement in various U.S. House campaigns a "great thing across the board". She spoke at a May 2010 fundraiser for the Susan B. Anthony List, a pro-life political advocacy group and political action committee that supports pro-life women in politics, in which she coined the term "mama grizzly". Palin endorsed Nikki Haley for the Republican nomination for Governor of South Carolina three weeks before the election. At the time of the endorsement, Haley was polling last among Republicans; she ended up winning the nomination and general election. ^ "Alaska Division of Elections November 7, 2006". Alaska Division of Elections. November 7, 2006. Retrieved April 22, 2019. ^ a b Elis, Roy; Hillygus, D. Sunshine; Nie, Norman (December 1, 2010). "The dynamics of candidate evaluations and vote choice in 2008: looking to the past or future?". Electoral Studies. 29 (4): 582–593. doi:10.1016/j.electstud.2010.04.005. ISSN 0261-3794. ^ "Palin vs. Obama: Death Panels". www.factcheck.org. August 14, 2009. Retrieved June 28, 2016. ^ "Death Panels? Sarah Palin Was Right". Cato Institute. December 22, 2009. Retrieved September 13, 2015. Look up Palinista, Palinism, or refudiate in Wiktionary, the free dictionary.